A pair of Yamaha cafe racers from the opposite ends of the capacity spectrum, Roland Sands gets stuck into the Indian FTR 1200, and some sad news from the Vincent scene. Vale Patrick Godet The renowned Vincent builder Patrick Godet passed away on Tuesday. His Swiss friend Fritz Egli (yes, of Egli-Vincent fame) made the announcement and requested privacy. 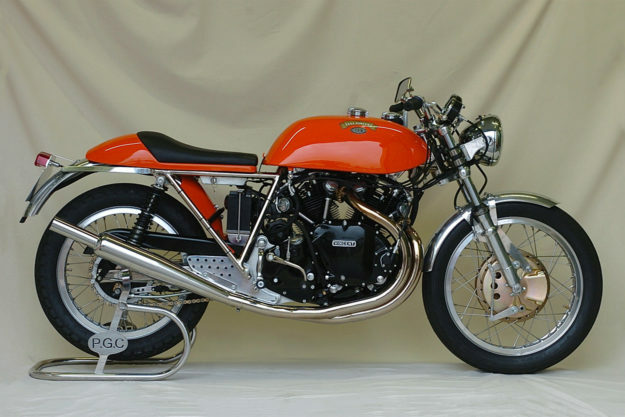 Godet was well known for his exquisite restorations, and restomods such as the 1330 Cafe Racer and the less radical Sport GT. 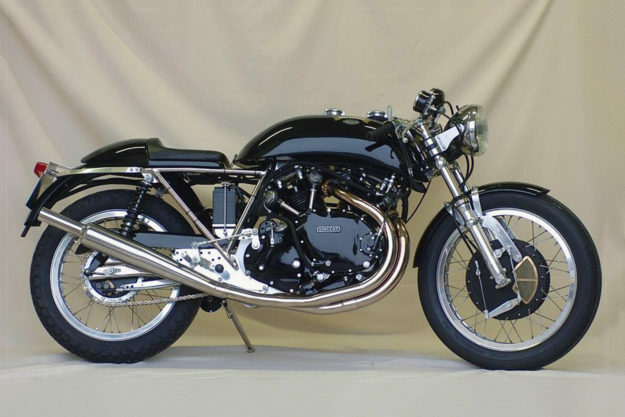 These used Black Shadow engines with increased displacement (measuring 99 RWHP) squeezed into the Egli-Vincent frame, with Fritz Egli’s approval. I clearly remember stumbling across one of these several years ago at the Wheels & Wheels festival in Biarritz, and it was truly a sight to behold. Godet was also active in the French classic racing scene, riding a Black Lighting and building smaller capacity ‘Grey Flash’ machines for others to race in events like the Bikers Classic at Spa-Francorchamps. Fittingly, one of his bikes was also displayed in the famous Art Of The Motorcycle exhibition at the Guggenheim Museum in 1998. 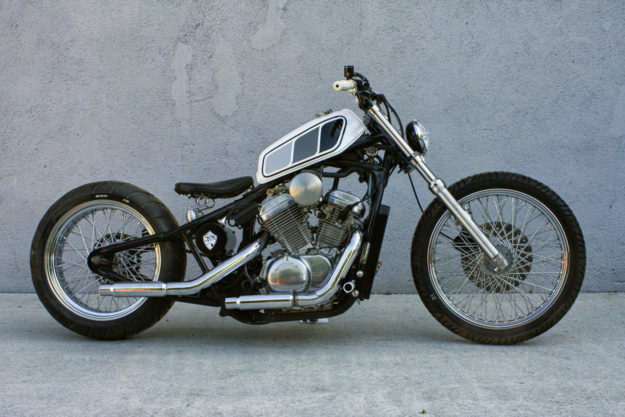 Yamaha Scorpio Cafe Racer By Jowo Kustom Yamaha’s bare-bones Scorpio 225 is one of those bikes that flies under the radar. Which is just as well, because it’s plasticky and unattractive. It’s mostly sold in Indonesia and the Philippines, with the occasional shipment heading to Australia and New Zealand for riding school and commuter duties. As we all know by know, Indonesian custom shops are remarkably inventive, and a shop called Jowo has managed to turn the Scorpio into a thing of beauty. 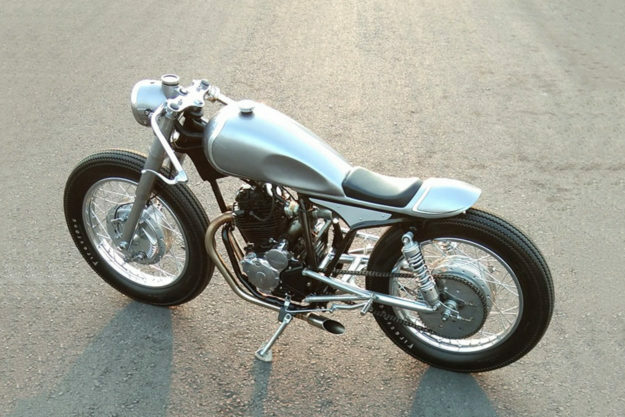 Under the tutelage of leader Yohanes ‘Anes’ Marse, the Jowo crew have heavily modified the frame and swingarm, and reconfigured the exhaust port on the single-cylinder engine to take twin headers. 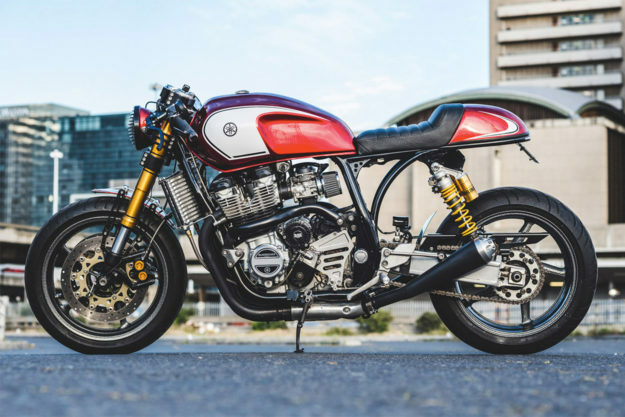 Yamaha XJR1300 by Ian Ketterer Yamaha quietly dropped its mighty XJR1300 a couple of years ago — another casualty of ever-tightening emissions regulations. And although the 1251cc brute had a solid following in Europe and Australia, it never made it over to the States. 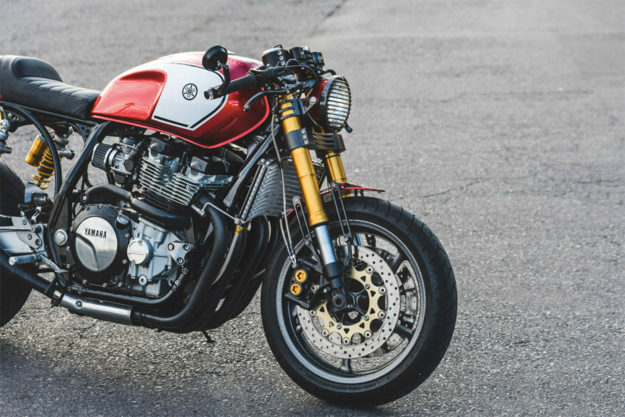 The occasional XJR1300 custom has popped up over the years, and this is one of the cleanest we’ve seen. 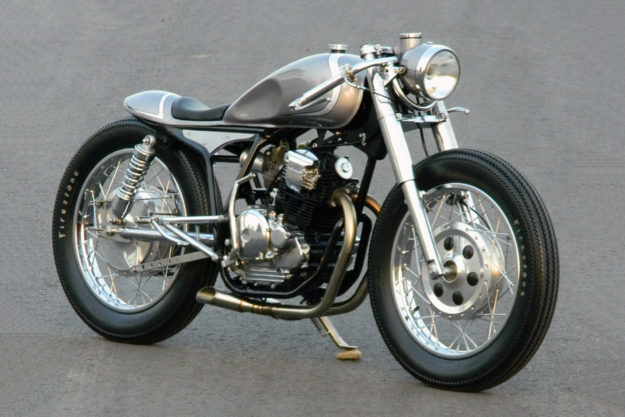 It’s from South African garage builder Ian Ketterer, who operates under the name Blacksilver Customs. 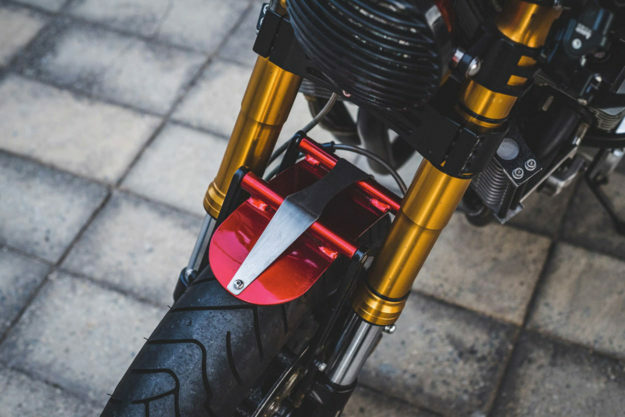 He’s added the front end from a Yamaha YZF-R1, designing and machining new triple clamps himself to make it fit — and shortening the wheelbase slightly in the process to sharpen the handling. There’s a matching R1 wheel at the back too, which required a new axle and swingarm mods. 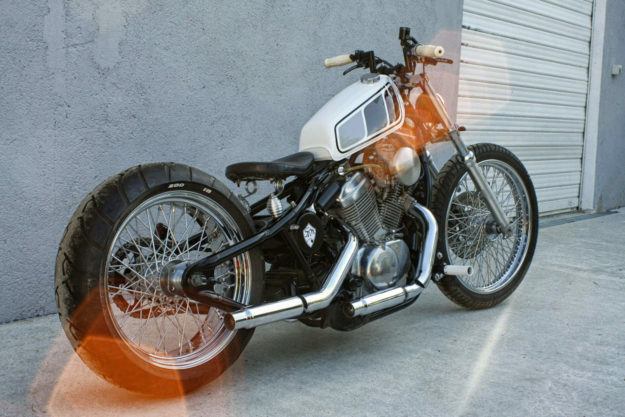 Honda Shadow bobber by Seb Kustom We love an oddball custom that raises a smile, and this quirky bobber from France fits the bill. 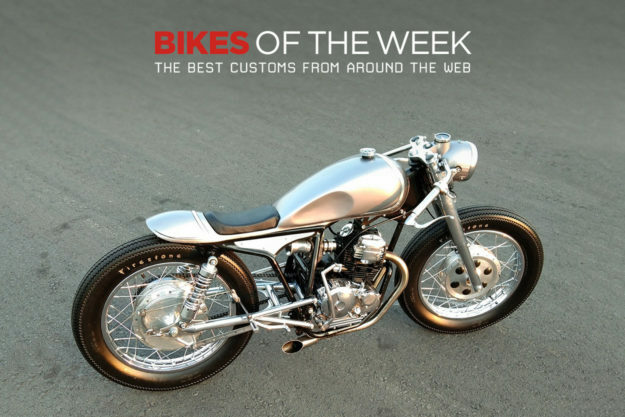 The enigmatic builder known simply as Sébastien spent several years on this project, grafting on a rigid tail and turning Honda’s bland middleweight cruiser into a bike that would draw a crowd wherever it’s parked up. Séb usually works on more conventional fare, such as the BMW K series or the Kawasaki Zed. But while rummaging through the dusty attic of his grandmother, he discovered a Yamaha 125 DTMX tank and a Marchal fog light, which once belonged to his father. 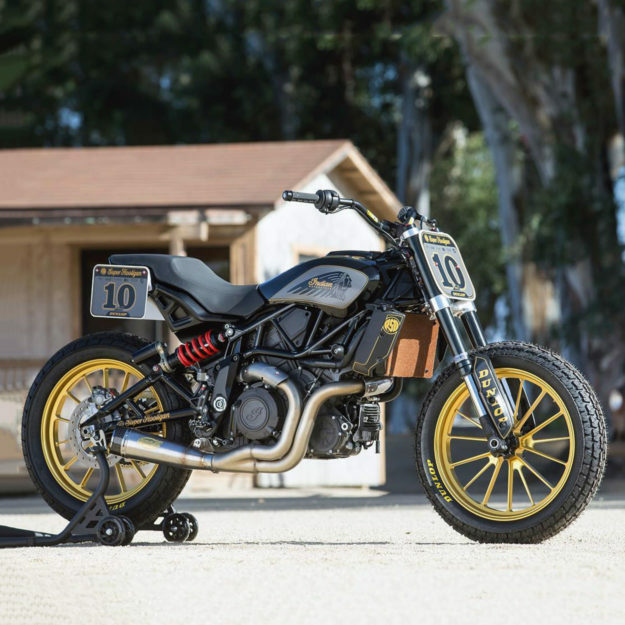 Indian FTR 1200 Super Hooligan by RSD They say that trends are cyclical, but this is ridiculous. 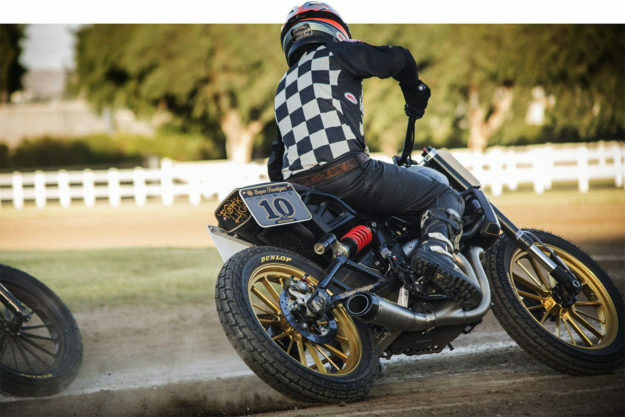 Indian’s new FTR 1200 road bike is inspired by the FTR 750 flat tracker, and now Roland Sands has taken the FTR 1200 and converted it back into a tracker ready for the Super Hooligan class. It may sound ludicrous, but the RSD tracker looks very good indeed. Most of the mods are technical: the 120 hp engine has been detuned to deliver power as smoothly as possible on the track, there are adjustable triple clamps to increase the steering lock and modify the geometry, and the battery has been moved to just in front of the back tire. Other mods include new engine cases, dual throttle bodies, and a few secret ingredients lifted from the FTR750 racer (and a Pikes Peak racebike that RSD also built). The oil cooler has been ditched—apparently it’s not necessary—and weight has dropped a whopping 53 pounds to 456 (206 kilos) at the curb. 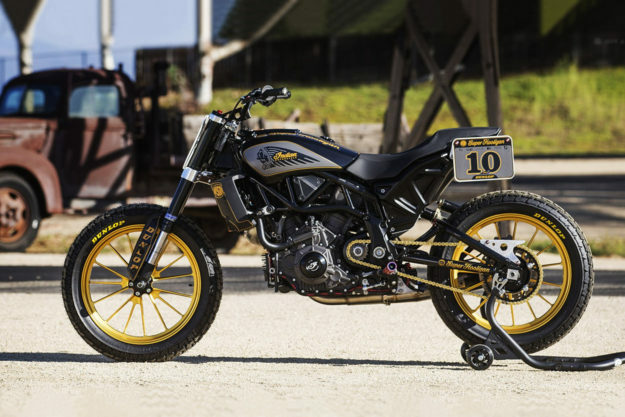 Best of all, Roland Sands Design are apparently putting together an accessory package of flat track bits for Indian, which should include new wheels, pedals, levers, grips and more.